» The future will be dockless: could a city really run on ‘floating transport’? The future will be dockless: could a city really run on ‘floating transport’? Floating transport has obvious appeal to investors, especially those sore to have missed out on the Uber gravy train. Venture capitalists’ enthusiasm to jump on the next big thing in transport is the best explanation for the astounding US $300m (£226m) raised by scooter company Bird, at a valuation of $1.7bn, last month. That was matched this week by Uber and Google’s investment in Bird competitor Lime at a $1.1bn valuation, as the company rolls out (sorry) its bright green scooters to Paris, entering Europe for the first time. 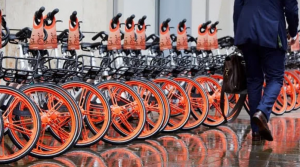 But simply being profitable doesn’t necessarily mean floating transport is good for a city, and the growth of the sector has been a bumpy ride. A big problem is that pavement is a shared space, and a limited resource. The overcrowding problems San Francisco has seen with Bird scooters are mirrored in London by Ofo bikes – a model where users abandon their vehicles wherever they want inevitably results in pavements littered with out-of-service rides. That can be annoying, unsightly or actively dangerous, depending on the circumstances. In London, parents have complained of having to push prams onto the road to get round piles of bikes, while wheelchair users in LA can find a previously accessible route blocked by a wayward scooters.